Our dog Abby was bitten by a Rattle Snake last Tuesday. She’s okay though, it was a dry bite, but it left a nasty wound on her upper foreleg. She never showed any signs of discomfort, except for the discomfort we caused her while cleaning her wound. 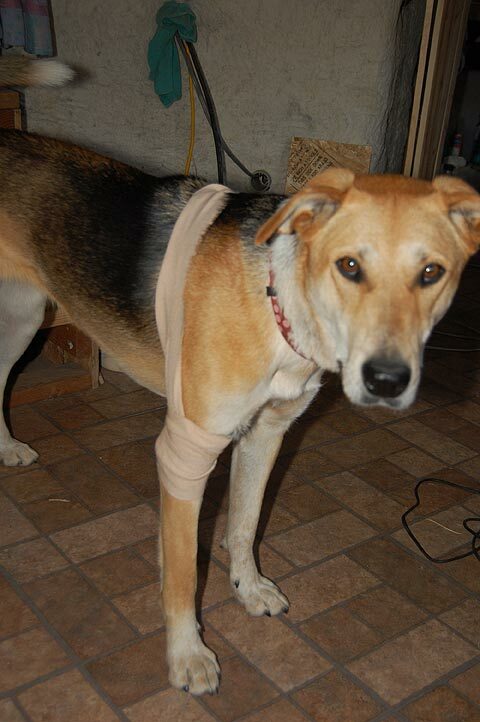 It’s hard keeping an elastic bandage on an active dog. It was basically to keep her from licking the poultice of Bentonite Clay Powder (excellent for drawing out toxins) mixed with activated charcoal, Slippery Elm bark, Plantain leaves, and colloidal silver. Then we gave her Echinacea, Skullcap, Goldenseal root, Colloidal silver, and activated charcoal orally. 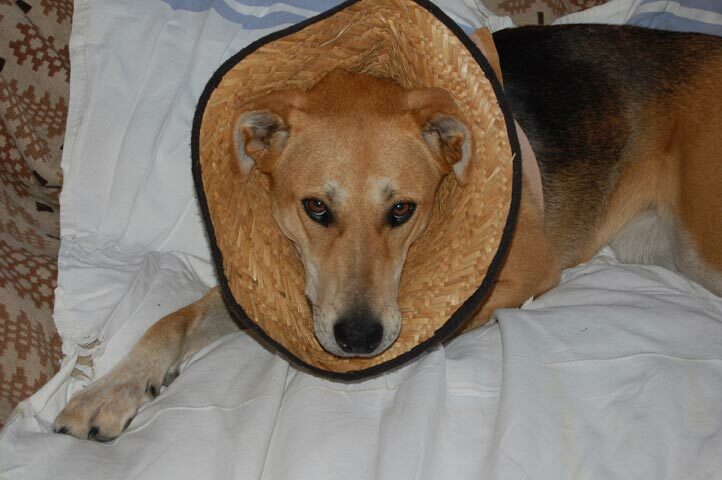 So we moved to next step in lick prevention… ye olde make-shift Elizabethan collar. Made out of an old gardening hat. She doesn’t look too thrilled, but it worked. We are happy to report that her wound is healing nicely. We are applying a salve of comfrey and other herbs to speed up the healing process. 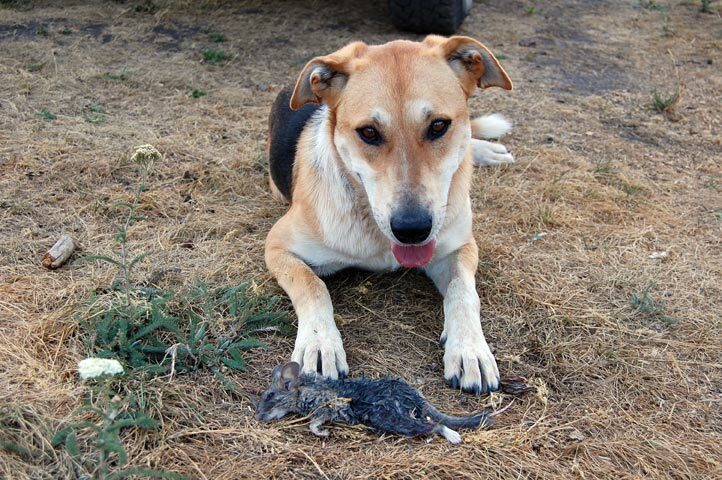 Her energy is good, though she is starting to chase more chipmunks… and she found, caught and consumed her first Pack Rat. Her she is with her trophy before she ate it… except the tail. A rather smallish Pack Rat (about 8″ from nose to tail). 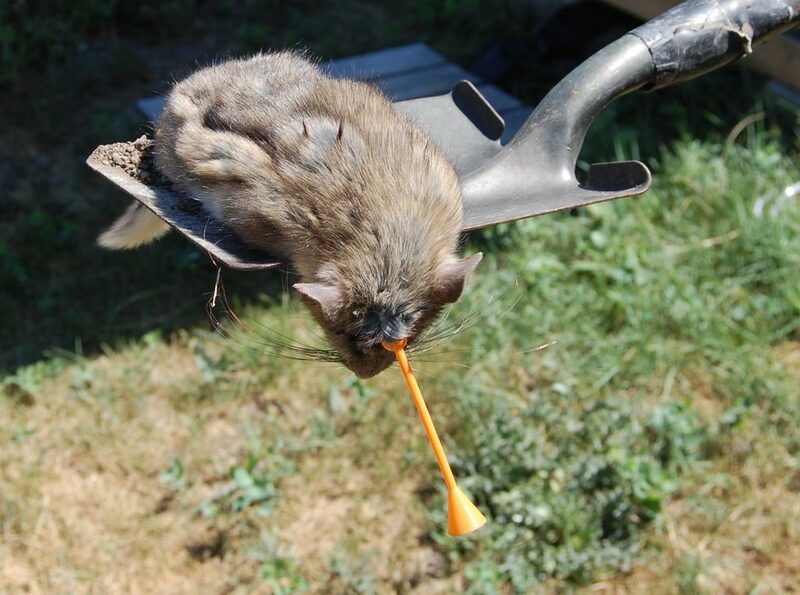 Not like the Pack Rat she pointed out about three weeks ago, that I ended up killing with the blowgun. That sucker was about 18″ from tail to nose and it weighed about 4 lbs. 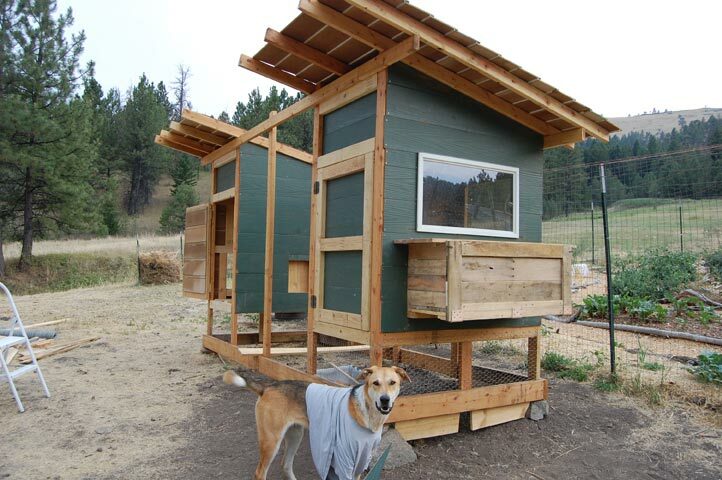 We are almost finished building our chicken coop. 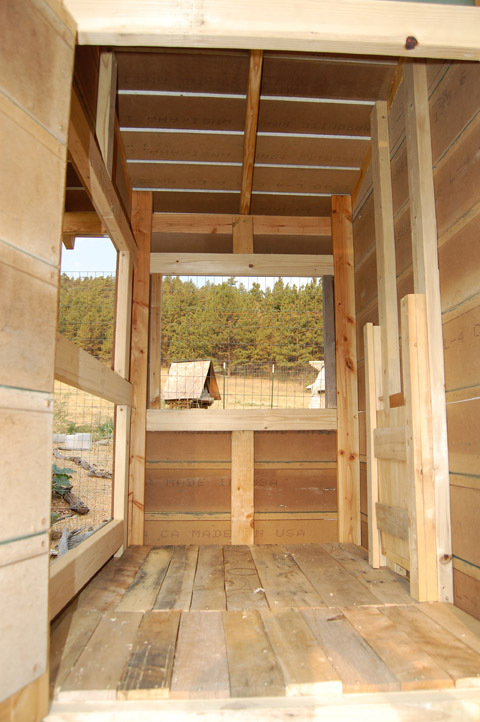 We have one more nesting box to build, the door to frame and hang, and attach the wire to the center walls. We’re getting 10 free chickens within the next week or so. We still have to caulk and paint it. But it’ll be ready when they arrive. When we get Guinea Hens next season their cabana will be waiting for them. The North Cabana with completed nesting box and window. Yes, Abby with a t-shirt… another way to keep her from licking her wound. Cabana interior. 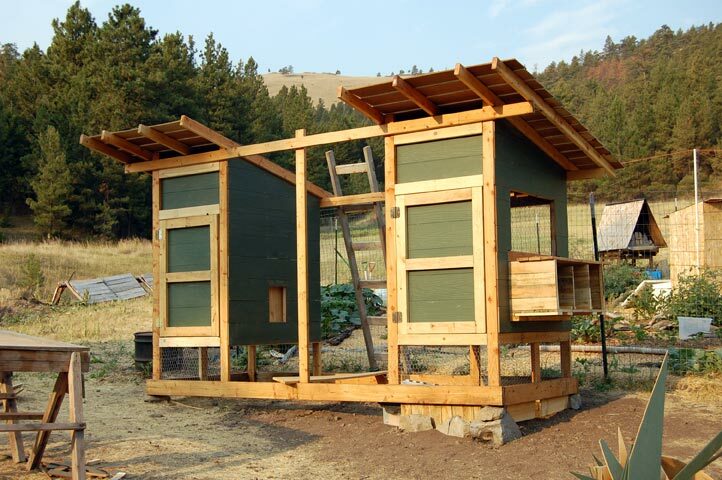 Two windows, nesting box, door access for cleaning, and sliding chute for chickens. The floor is made out of strips from pallets. Never underestimate the usefulness of wood pallets. 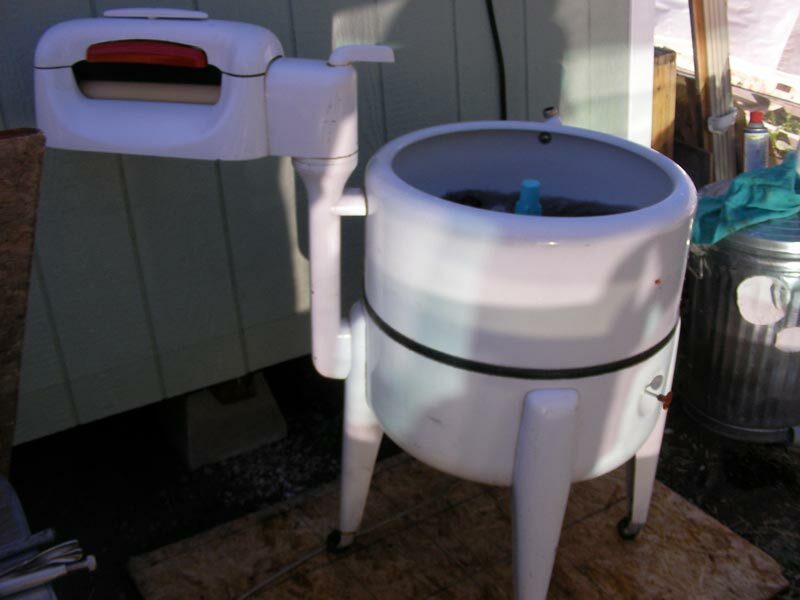 And… finally… speaking of things most foul… here’s our new Maytag Wringer Washer we bought from some friends for $30. The best washing machine… ever. The washboards are now TV-less trays. This entry was posted in Mountain Living by Montana Animal Farm. Bookmark the permalink.